The location of the conference is Zagreb, Croatia. 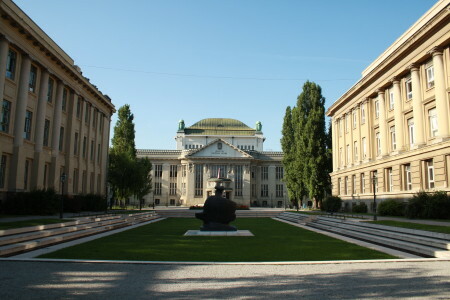 All conference sessions will be held in the premises of the Department of Geography of the Faculty of Science and the Faculty of Technology UNIZG, Institute for Social Science Research Ivo Pilar, and Croatian State Archives, all at Marulić Square 19, 21. The venue is located in the center of the city, at a walking distance to the main city square. This gives all of the participants an opportunity to enjoy the city-scape during breaks between sessions. Zagreb has an international airport with direct flights from all the major European cities (London, Paris, Rome, Frankfurt, Vienna, Istanbul, Lisbon, Copenhagen, Bruxelles, Zurich, Vienna, Belgrade). Average plane ticket from any of those cities is roughly within average for standard intracontinental flights (300 Eur), however, there is a number of low-costcompanies flying to Zagreb and if bought in advance the plane ticket is much cheaper even with regular national carriers. Train connects Zagreb to the rest of Europe via direct lines to Budapest, Munich, Belgrade and Vienna. Zagreb is also a major highway junction well connected to European highway network. Those attending pre-conference field-trips in Zadar area (Kornati archipelago national park and northern Dalmatian hinterland) are advised to plan their travel to Croatia via Zadar. Zadar has an international airport (Ryanair hub in Croatia), highway junction to European highway network and ferry connection to Italy (Ancona). The transfer from Zadar to Zagreb for participants of pre-conference field trips in Zadar area will be organized and available without charging. All aliens who are holders of valid Schengen documents, as well as national visas and residence permits of Bulgaria, Cyprus, and Romania do not require an additional (Croatian) visa for Croatia. Please check the details for your country. Note that although Croatia is an EU member, the euro is not used there. The Croatian currency is the Kuna. See the current Exchange Rate.